Exploring the C-SPAN Archives is a collection of path-breaking research studies that use video drawn from the C-SPAN Archives. The book, based on the papers presented at a November 2014 conference, includes chapters that explore issues in presidential debates, minority representation, the presentation of the first ladies, stem research, and innovative ways to analyze video. The book is divided into five parts: Part 1 consists of an overview of and common scholarship using the C-SPAN Archives and how this research advances the conversation after previously published studies. Featured are the ways in which the collection is indexed and tips on how individuals can find particular materials. This section is essential for increased scholarship and pragmatic applications. Part 2 contains applied research using the video collection. Topics in this section include a look at oral histories of minority members of Congress, an analysis of presidential debates, and the presentation style of Michelle Obama. 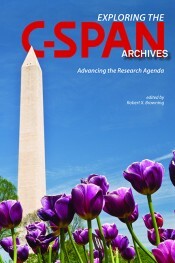 Part 3 is focused on STEM research, including concepts and contradictions in the debate over STEM initiatives, expertise and evidence in science presentations in the C-SPAN Archives, and the framing of technology issues in a C-SPAN television series, The Communicators. Part 4 presents innovative research using C-SPAN and new computer technology. Two scholars take different technical approaches to evaluate polarization and communication using audio levels and video images. Finally, in Part 5, David Caputo presents ideas on the value of massive open online courses (MOOCs) using C-SPAN and reflects on the use of C-SPAN for citizen education in what he terms the “postdigital world.” Additionally, Patrice Buzzanell contributes a reflective essay on the future directions of research using the C-SPAN Archives based on the essays in this volume.